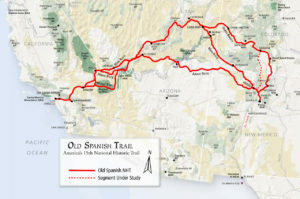 Old Spanish National Historic Trail–trade route from Santa Fe, New Mexico to Los Angeles, Alta California during the Spanish Colonial and Mexican periods. On September 22, 1838, Juan Manuel Lorenzo Trujillo (1794-1855) led an advance party over the Old Spanish Trail from New Mexico to California. This expedition changed not only the lives of their children but also the lives of everyone who participated in this journey, their descendants and those fortunate enough to live or work in La Placita de los Trujillos. To help study, preserve and protect, interpret and educate, and promote respectful use of the Old Spanish National Historic Trail and closely related historic routes, an OSTA Inland Empire chapter, called the Agua Mansa chapter, was established in November 2016. The NPS/BLM draft strategy for the Old Spanish National Historic Trail show the trail running through the Inland Empire where today’s Agua Mansa Road runs past the Agua Mansa Cemetery. La Placita, San Salvador, Agua Mansa—all names of the largest non-indigenous settlement on the Old Spanish Trail between Los Angeles and Santa Fe in the Mexican era. 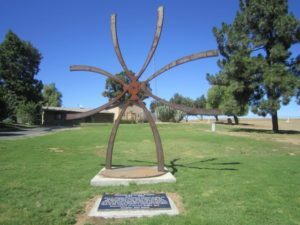 This peaceful, diverse community was established in 1842 when 10 families traveled across the Old Spanish Trail from Abiquiu, New Mexico to settle along the riverbanks of the Santa Ana River (modern day Riverside and Colton, CA) by way of Rancho San Bernardino. 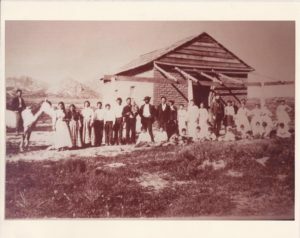 Upon arriving at the Rancho to claim the Lugo Brothers offer of land ownership in trade for settling and protecting the Rancho, Lorenzo Trujillo and the 10 families were informed that the offer was no longer valid. The families debated whether to follow Lorenzo Trujillo to the Santa Ana River and take Bandini’s offer of land ownership along the Santa Ana River or follow Santiago Martinez to settle on land closer to Los Angeles. The majority accepted the Bandini offer following Lorenzo Trujillo and the twin communities of La Placita de los Trujillo’s and Agua Mansa were born. 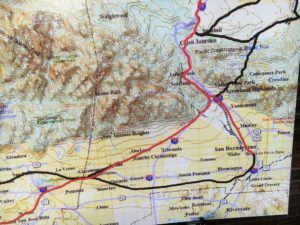 The original 2001 Feasibility Study route of the OSNHT included both a stub route from Cajon Pass ending at La Politana (Bunker Hill in San Bernardino) and a direct route from Cajon Pass to Msn. San Gabriel and Los Angeles. The 2016 draft Comprehensive Administrative Strategy released in September added the connecting Mission road (San Bernardino Road) from Politana, through Agua Mansa and west to Pomona where it joins the route going further west officially including the La Placita and Agua Mansa communities to the OST family. OSTA’s mission to study, preserve, protect, interpret, educate and promote respectful use of the Old Spanish National Historic Trail and closely related routes works well with the Spanish Town Heritage Foundation’s (STHF) mission of championing the Hispanic legacy of the Inland Empire’s first settlers by sharing their stories, creating cultural learning opportunities, and leading community efforts to restore and revitalize La Placita de los Trujillo’s. It was only natural for STHF to investigate the possibility of establishing an OSTA chapter in the area to works toward both organizations mission. Spanish Town Heritage Foundation hosted an organizational meeting in Riverside during September 2016 with over 20 in attendance. Interest and enthusiasm for a local OSTA chapter were high. Bylaws were reviewed, officers were elected and dues were collected. The big discussion of the evening was what to name the Chapter. La Placita, San Salvador, Agua Mansa, Inland Empire were all possibilities. Noting that most early maps labeled the area as Agua Mansa, it was decided to name the prospective chapter Agua Mansa. The chapter meets quarterly in January, April, July and October. Go to Facebook Old Spanish Trail Agua Mansa Chapter for details. 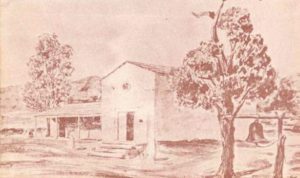 San Salvador de Jurupa Church (sketch) at along the Old Spanish Trail at the base of Agua Mansa Cemetery. Today, all that remains visible of the twin communities is the 1862 version of the Trujillo Adobe and the Agua Mansa Cemetery. The first school (the Trujillo School), the first church (San Salvador de Jurupa), and the Cantina are all gone. The actual OST is said to be today’s Agua Mansa Road that passes directly in front of the Agua Mansa Cemetery. STHF looks forward to working with the Agua Mansa OSTA Chapter to educate, preserve, and protect the Old Spanish Trail and La Placita de los Trujillo’s and Agua Mansa transforming the area into a living history park. Sculpture comemorating Lorenzo Trujillo’s gravesite at Agua Mansa Cemetary. 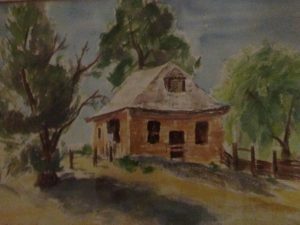 Watercolor image of the Trujillo Cantina, courtesy of Pat Stewart.